A giant offshore wind farm that could provide power for up to two million homes has been given the go-ahead by the government. Dogger Bank Teesside A and B would feature 400 turbines, with power cables coming onshore near Redcar to connect with the National Grid at Lackonby. Developers, the Forewind consortium, said it could create almost 5,000 jobs during construction. Once fully operational, it would power up to two million homes. Forewind is made up of four international energy companies - RWE, SSE, Statkraft and Statoil - which joined forces to bid successfully to develop the Dogger Bank zone. 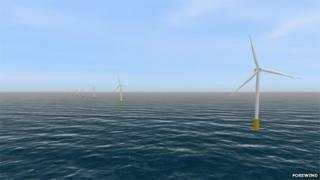 Together, they will form one of the largest offshore wind farms in the world. General manager Tarald Gjerde said it would create "significant economic benefits". The National Federation of Fishermen's Organisations said Dogger Bank was an important site for fishing. Dale Rodmell, assistant chief executive, said: "Our main concern is ensuring as far as possible that fisheries can co-exist with wind farm sites." Forewind said environmental assessments had been carried out and measures would be taken to mitigate any impact.